Leave CYLINDER installed or insert blue plug in REGULATOR INLET. 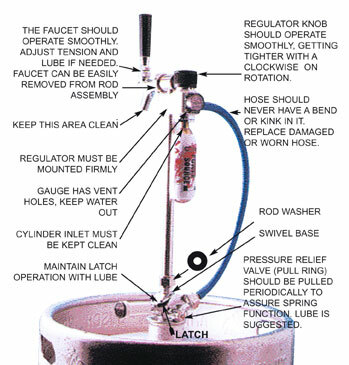 This will prevent water from entering the REGULATOR INLET. Turn entire Leland CO2 PicnicTap® upside down with the COUPLER pointing up. Put several drops of liquid dishwashing soap into the hole at the bottom of the COUPLER. The soap will help neutralize the corrosive nature of beer. Carefully pour some warm water into the COUPLER and with your finger over the hole, shake it to get the soap and water mixed in the ROD. Open the FAUCET and pour some more water through the COUPLER, this time with the FAUCET open. Rinse and leave everything open to air dry completely. The exterior needs warm soapy water sponged and then dried off after a rinse. Do not immerse REGULATOR in water. It is a sensitive instrument and will not work if wet. Allow REGULATOR to thoroughly dry before use. LUBRICATE SPECIFIED AREAS WITH VASELINE ONLY. DO NOT USE ANY TYPE OF OIL OR AEROSOL LUBRICANT. A CLEAN, WELL MAINTAINED TAP WILL LAST FOR YEARS. High pressure equipment must be repaired by our professionally trained staff or our designated distributor using parts labeled for a Leland CO2 PicnicTap®.